CES: Newer Technology announced its newNewerTech iPhone Accessory Line, consisting of six products that add iPhone functionality and user convenience. Their most interesting accessory is the $35 iPhone Speaker Dock & Hands-Free Mic. 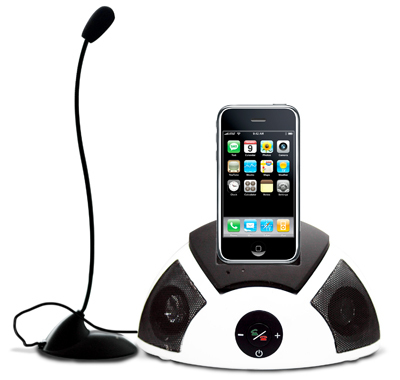 It lets you use your iPhone to make conference calls, as well as listen to amplified music and audio soundtrack playback. Hmmm. I could actually make use of this. Just the dock with mic, not the other bits. yeah – the other stuff looks like same-old same-old but the speakerphone looks pretty cool. Looks like a great idea. In fact, I preordered one a month ago but, alas, they have not met their shipping target (today). I hope it doesn’t take too much longer for them to get this into the channel. I’ve yet to find anything else with comparable functionality. The volume of the speakerphone on the iPhone itself is pathetically low, so being able to amplify the output (without the noxious buzz that most speaker docks exhibit with the iPhone) would be really nice!